Five years ago, I went to Mt Pinatubo together with a group of ultra runners where five of us were training for the 1st BDM 102. While the 5 of us were having our “pit stop” at the edge of crater lake, I started to discuss with the group about my plans in promoting ultra marathon events in the country. And the rest is history. The ultra runner’s group whom we asked to join in our trek to Mt Pinatubo just completely “vanished”. I wonder why. 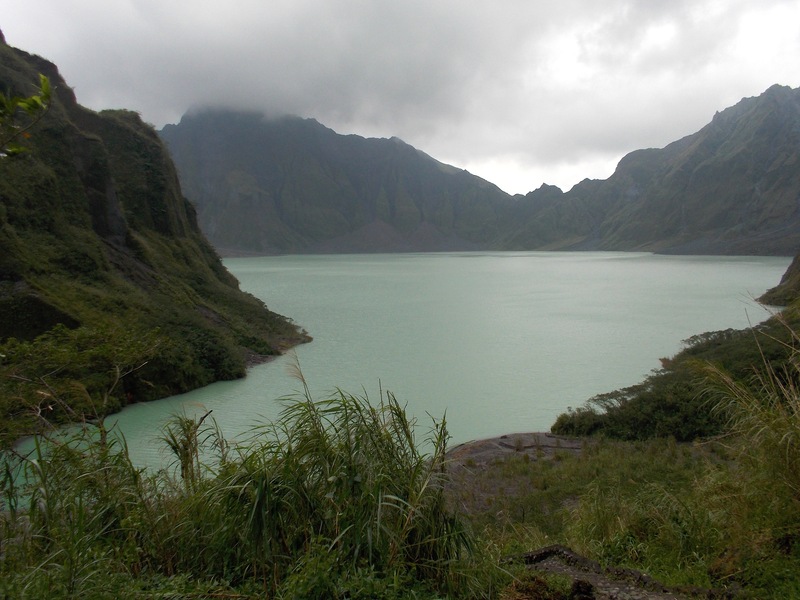 Every edition of the Mt Pinatubo 50K Trail Challenge has a unique story and experiences to every runner as the landscape of the route would completely change every year. In short, there is a different story for every runner every year. And the challenges brought about by the landscape, the river, the lahar, the rocks, the elevation, the heat and the rains make this event totally different from the other trail running events in the country. This is a trail running event where you need agility, quick thinking, smart running strategy and orienteering skills in order to run safely back to the finish line. If you look closely on the elevation profile of the race route, this could be the first ultra “FKT” (Fastest Known Time) event held in the country. The fastest recorded time was 5:35:09 hours by Marcelo Bautista while the Lady’s Course Record is 8:00:59 by Majo Liao. These course records stand up to the present. For this year, the event was held after a day when Typhoon Santi’s strong winds had devastated the towns of Tarlac, Pampanga, Bataan and Zambales. The roads to the starting area, Barangay Santa Juliana in Capas, Tarlac had been filled with fallen trees and debris but with the immediate response from the Local Government Disaster Committee, the roads were cleared for traffic. Much to my desire to personally recon the route on the day before Race Day, I was advised by the local authorities that It would be best to wait for the river’s depth to subside and start the race when there would be natural lighting as the sun arises. I was expecting only 52 runners to join this race. I guess, 3 of the runners who requested to be included in the list of registered runners decided not to join the race as a result of the typhoon. I decided to run the race as the “sweeper” and safety marshal for the last runners. Most of the runners arrived at the assembly area few hours before the start of the race and they were surprised to see the devastation brought about by Typhoon Santi. I made clear to all the runners that the race start would be delayed for us to wait for the day’s sunlight to appear. At exactly 5:35 AM, the race started in front of the Barangay Hall of Santa Juliana, Capas, Tarlac with 49 runner-starters. My salute goes to these runners who braved to be at the starting area. Runners who had their first time to join the race are always surprised with the first river crossing which is about 1.3 kilometers from the starting area. It is always the same feeling and apprehension for all the runners. The river had been wider and some portions are deep and the current is strong. Runners would cross the river deliberately in groups trying to test the depth and current of the flowing river. At a distance, every runner would see the road that leads to the cogon/tall grasses and that was the target of all the runners. Due to the loose and unstable ground brought about by the typhoon, the first 4 X 4 vehicle to serve the runners as the Aid Station had been stalled at Km 8. The 2nd 4 X 4 vehicle move on to about a few kilometers. I started to run the race after 5 minutes from the Gun Start time. I purposely made myself as the “sweeper” and safety runner for the runners at the rear. After one hour of hiking and running, I was able to spot the stalled 4X4 vehicle and the last runners leaving the Aid Station. I immediately called my staff at the Starting Area to send another 4X4 vehicle to reach Kilometer 17, if possible. I have to wait for about 45 minutes for the replacement 4X4 vehicle to arrive at the stalled vehicle. Once it arrived, I continued my run with the instruction for the replacement vehicle to move forward closer to Km 17 if the condition of the ground and the river permit. The replacement vehicle passed me somewhere in Km 10 and I could still see the last runners in front of me with a distance of about 500 meters. However, the driver of the replacement 4X4 vehicle had to stop the vehicle about 1-2 kilometers ahead of me due to loose ground and deeper parts of the river. The race marshals and volunteer that I requested to be positioned at the Crater Lake had to walk for about 6 kilometers but decided not push through to the peak of Mt Pinatubo due to the lack of time. With this situation, the runners who will be reaching the turn-around at the Crater Lake will not be able to see my Race Marshals. I was amazed and surprised to see the landscape to have completely changed after a year! Gone are the temporary trail where the 4X4 vehicle would run through. Another landscape of rocks and lahar had appeared. The temporary waiting area for the 4X4 vehicle at a place called “GMA” is completely gone. Most of the runners at the rear were lost at this portion but with the presence of the Race Marshals and Volunteer, they were advised to go to their position and were able to get their proper direction. When I reached the “GMA” area, I was able to catch up with the last runner. The distance to the peak is still 7-8 kilometers from this point. From here, I pushed the last runner to continue the race and be able to reach the turn-around point. The first runner going back to the finish just dropped by at the “GMA” as we started our trek to the peak. After about 500 meters, we met the 2nd runner, Robert Watson and the third runner, July Oconer was 200-300 meters behind. After 15 minutes of hiking, we met the 4th runner, Graciano Santos. As we reached the Waiting Sheds at the foot of Mt Pinatubo, we were able to meet a group of 5 runners coming from the peak. More runners would be going down from the peak as we were trying to trek the last 2 kilometers to the peak of the mountain. As we reached the peak of Mt Pinatubo, we were able to catch up with the last 4 runners who just came from the Crater Lake. After a brief “pit stop” at the Crater Lake, we were ready to move on for the last half of the course. Coming from the peak and going back to the finish line could had been very easy if not for the numerous rocks to step on, more time spent on looking for open ground to land your feet, and the river to cross. After a few kilometers, the last runner, Joel and I were able to catch up with the 4 last runners. It was already noon time and the sun was already on top of us as the sky went clear from clouds. It became hotter and we tried to conserve the water we had in our hydration bottles and tried our best to reach the Aid Station at Km #11/49. Three of the runners of the last 4 runners went ahead of us and the 4th runner, Allenstein joined us as the last 3 runners. After hiking, jogging and telling some “running” stories with my companions, we were able to reach the Aid Station. This is where we ate boiled eggs and bananas; refilled our hydration bottles; and drank lots of soda drinks sponsored/provided by our ultra runner and friend, Jun Padilla. I was surprised to see that the river had subsided and became narrow. More lahar grounds were exposed as a result of few hours of sunshine but some were not stable as our feet would sink for a few inches when walking. At one point, I would remove my shoes and clean them from the accumulated lahar/sand with the flowing river. The flowing river carries a lot of sand/lahar and they ultimately gets inside the shoes and accumulate on the toe box/sole portion of the shoes. After a few kilometers, we reached the last Aid Station and we were able to catch up with the rest of the runners as some would eat, refill their bottles and wash their shoes from the lahar/sand. It was the last 8 kilometers to the finish line but some runners have the tendency to be lost on this part of the route. I was with another runner-friend, Many Ocampo, from this point as I tried to encourage him to run with a faster pace and by taking the shortest route/trail to the last river crossing. After some “hit and miss” and “bushwacking” on tall grasses, we were able to reach the 2nd to the last river crossing that would lead us to the trail to the last river crossing. At this point, I became the “guide” for the rest of the runners at the rear on the last 3 kilometers of the course. I felt strong and faster with my pace from this point. It is just a matter of time and I know I would be able to finish the race in less than 12 hours! Despite the more challenging situation of this year’s edition, all the starters were able to finish the race. I could see that our runners are becoming braver, stronger and smarter. Runners attempting to join this race must have some knowledge on orienteering. Some skills on tracking would also be needed. A runner is smart if he/she tries to look for marks/foot prints or signs of runner’s track along the rocks and trails. Most of the runners are “repeaters” in this event and I am glad they were able to act as guide/pacers to other runners. This is the essence of trail running—everybody helps each other to overcome the challenges along the route and be able to finish the race safely. Integrity of the race was maintained and the runners went down to the crater lake despite the presence of eroded portion of the stairs. Next time, I would advise that handheld digital camera will be required for each runner and for them to submit a “selfie” picture of themselves with the Crater Lake as the background as an evidence that they reached the turn-around point. This is an “out of the box” way just in case the Race Marshals would not be able to reach the Crater Lake. Since I included a First Aid Kit as a required equipment carry-on for each runner, this will be thoroughly inspected before the race. I am glad there were no serious accidents during the race. Runners must be always vigilant and observant with the course features that they would pass on their way to the peak. These land and river features would be needed for the runner to guide him/her back to the finish line. There are steel towers along the left side of the open space/river as the runner would run towards the peak. The same towers would be seen on the right side of the runners as they go back to the finish line. Last year, we had time to prepare for ribbons tied on bamboo sticks but on race day, most of the sticks were taken by Aeta kids and made as souvenirs. What is worse was that most of the runners were not able to see these ribbons that we placed along the route on the first 5 kilometers as most of the runners followed the trails. For this year, we were not able to place those ribbons but runners were smart to follow the river and made their run with due direction towards the South. The Aetas/local tribe in the area were very helpful that they made some access trails on the steep banks of the river for the runners. They even see to it that they give instructions on where to go to avoid the deeper parts of the river. Nobody from the tribe asked for any food or money from the runners. If not for the typhoon, we could have pushed the 4X4 vehicles to reach “GMA” where runners would be able to replenish their hydration before their final trek to the peak of the mountain. I know that some runners were asking for some water after coming from the peak but they persevered until they reach the stalled 4X4 vehicle on the last 12 kilometers. On the next edition, we will see to it that every runner must be able to carry at least 2 liters of water on the last Aid Station before their trek to the peak or before reaching the turn-around point. All Finishers were able to receive new versions of the Finisher’s T-Shirt and Finisher’s Medal. On the next edition of this race, we have to add some amount for the registration fee in order for us to offer Cash Prizes to the podium finishers. We will adopt what we will do with the next edition of the Tagaytay To Nasugbu 50K Ultra Marathon Race. We will continue to announce the details of the next year’s edition through our Facebook Event Page. Every year, we have Foreigners in this race and we hope to continue accommodating them in our next editions.